I promised myself I would enter more creative challenges this year, so today I created this card using the "Field Flowers" stamp set from Stampin' Up! The colour combination of Daffodil Delight, Lucky Limeade, Pumpkin Pie and Early Espresso had me stumped for a little while, especially as I wanted to finally ink up this beautiful stamp set. It dawned on me that I could create some very interesting neutrals by combining some of these colours without totally loosing the integrity of the colours. This is what I came up with. I love how the colours "glow". After struggling with these elements to fit with my vision, I'm reasonably happy with the outcome. 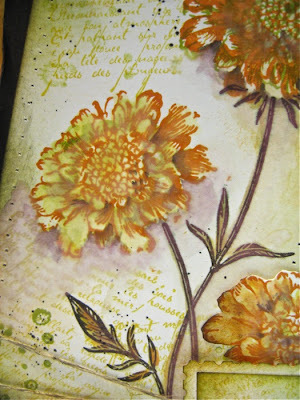 There are lots of techniques used including water colouring with an Aqua Painter, double stamping, stamping off, fussy cutting, spritzing, dry embossing and sponging. I managed to get the flowers looking different even though I used the same stamp. The lowest flower is cut out and raised on dimensionals. The "white" background is dry embossed using the "Stripes" embossing folder from Stampin' Up! It has been pre-inked with Pumpkin Pie and Lucky Limeade classic inks. Don't you just love the "Postage Stamp" punch? Team it with the 1 inch square punch and the possibilities are endless. I blind stitched around the edge of the top piece of card using my sewing machine then used Linen Thread to sew a cross at the top Left hand corner. 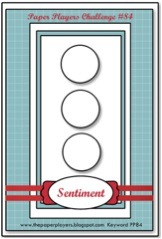 Linen Thread is also used to ground the sentiment. Here you can see me reverting to my favourite "Collage"style where I've stamped multiple layers and used a variety of stamps from 2 stamp sets: - "French Foliage" and "Field Flowers". Both are available in the current Stampin' Up!® Idea Book And Catalogue. I hope you get some inspiration from this card. I really enjoyed playing around with techniques to create something a little different. .......and late mail makes me one happy stamper. 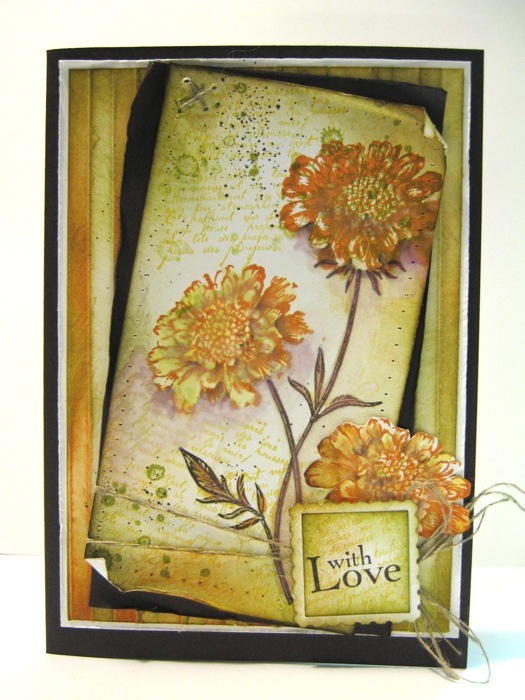 This card was chosen as a Colour Queen Courtier in the Colour queen Challenge #126. Thanks girls! Super pretty! A wonderful take on the sketch! Beautiful card, Ann, I love what you did with the colors, the card is fabulous! Thanks for joining us this week at the ColourQ and sharing your card. 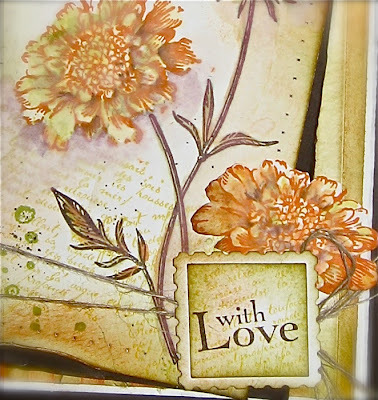 This is gorgeous--how could I not love it, you used my sketch and the CQC colors! What a beautiful creation! Thanks for using my sketch this week at the Paper Players as well as the CQC hues! Ann, this is really gorgeous~ I love the distressing! Thank you so much for joining us at the colourQ this week! Beautiful - a lot of work, but the result is definitely worth it. Thanks for sharing. What a gorgeous card Ann! I love the way you used the colours to create the soft look, this is wonderful! Thanks for joining us at the Paper Players. Wow! This is a masterpiece, Ann! Your flowers are absolutely fabulous! Thanks for playing with The Paper Players! Simply gorgeous, Ann! You did a fabulous job with the sketch, too! 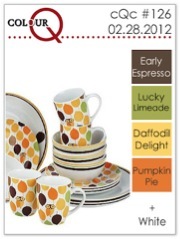 Thanks for joining us at the colourQ this week! Congrats..well deserved. This card is simply stunning. Your card is amazing! I just love those colors together and it's something I never would have thought of. TFS! Beautiful use of color and texture!